Fr. Daniel Wafik Habib was born in Warwick, NY and grew up in New Jersey. He attended St. Mark Coptic Orthodox Church in Jersey City, NJ and St. Antonious and St. Mina Coptic Orthodox Church in East Rutherford, NJ for most of his life. He attended New York University and graduated with a B.A. in Philosophy. Following his undergraduate studies, he studied law and obtained his J.D. from American University’s Washington College of Law in DC. He practiced law in the States of New Jersey, New York and Hawai’i before working part-time in Boston, MA and attending Holy Cross Greek Orthodox School of Theology. At Holy Cross, he obtained a Masters in Theological Studies. Thereafter, he and his wife moved to Southern California and began serving under His Grace Bishop Serapion. 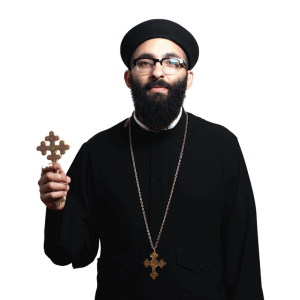 On October 19, 2008 he was ordained a presbyter in St. John Coptic Orthodox Church at the hands of His Grace Bishop Serapion and His Eminence Metropolitan Hedra.